Angela Slatter, who has won a number of international awards for her short fiction, goes to Brisbane, or Brisneyland as she prefers to style it, for her first full length novel. Vigil is an urban fantasy which sees the streets of Australia’s third largest city shared between the Normals and the supernatural Weyrd. As is often the case, only a select few Normals are aware of this sharing arrangement. The Weyrd community keeps very much to itself and has put limits on the excesses of its members, which previously included preying on the Normal population. Enter Verity Fassbinder, half-human, half Weyrd able to walk in both worlds, with super-strength from her Weyrd side. Verity works as a freelance investigator, partly in penance for the sins of her Weyrd father Grigor, a kinderfresser, who killed normal children for the highborn Weyrd. Verity is tasked by the Weyrd Council to investigate when children once again start going missing. Soon her troubles mount, with dying sirens (the avian kind), a monster roaming the streets, rampant angels and the search for the missing son of a millionaire. While in genre terms this is strictly fantasy, Vigil plays out strongly along crime fiction lines with Verity’s actions and first-person narrative placing her squarely in the noir private detective mold. And like all good noir detectives Verity gets into plenty of scraps and when she is stuck she just pushes until she gets a reaction. True to the crime genre the action is tightly plotted and the weary narration gives a solid feel to some fantastical going-on. 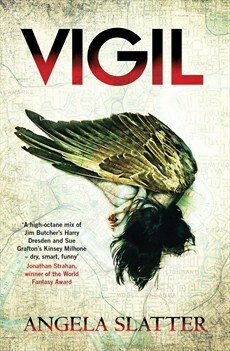 Overall, Vigil is a great start to a fascinating new series for both urban fantasy and crime fans with a refreshing Australian voice, setting and style. It will be interesting to see where Slatter takes both her characters and her world in future volumes.